Stories are Good Medicine: Are you there, YA readers? It's me, your period. Are you there, YA readers? It's me, your period. Judy Blume invented puberty. Or at least, that's what this fascinating article from The Boston Phoenix contends. And, after thinking about it, I'm inclined to agree. As a bookish library goer - even as a girl - I got a lot of my information about puberty from nonfiction books culled from the children's section. Books called things like Period featuring cartoon images of showering mom-parts and dad-parts. Informative, and yet still pretty euphemistic. I was recently reading Laurie Halse Anderson's excellent YA novel Wintergirls - and was caught short by the protagonists' conversation about menstrual products with her stepmother. Of course, the conversation is highly relevant to the plot - the character has an eating disorder and is hiding the fact that she no longer menstruates. But the reason that passage jumped out at me was entirely different - it was because, I realized, despite my steady diet of (modern) MG and YA literature, it's still fairly rarely that menstruation is mentioned. This to me is not a trivial issue. As someone whose training is in both pediatrics and public health, I know that silence around menstruation is secondary to shame about menstruation, and shame about menstruation is directly linked to the shame girls and young women around the world feel about their bodies, body parts, and bodily processes. Such shame is crippling, isolating, and among other things, exposes us to social and personal violences. In fact, menstrual product activism is a critical part of feminist activism in many countries. Check out this wonderful innovation - banana leaf based menstrual pads- which were developed in Rwanda, a country where, like many other places, girls and women often miss school or work due to the high cost of menstrual products and shame around the physical process. Similarly, women in South Asia frequently find themselves experiencing vaginal infections due to the necessity of washing their reusable menstrual cloths quickly and at night, or half drying them in secret locations,out of the eyesight of male family members. My mother recently visited a village menstrual pad factory begun and operated by local women concerned about their own economic independence, but simultaneously, their own health and the health of their fellow village women. Even in the U.S., menstrual product advertisements (like this one featured on the fabulous sociological images site), make clear that menstruation is a process to be hidden, dreaded, and at best 'dealt with' (certainly, for instance, not celebrated). After all,why else do tampon ads rarely mention the word menstruation, and, as the sociological images ad points out, feature women wearing white clothing? The discourse here is clearly about technology and commerce (in the form of menstrual products) being the key to, as a popular tampax ad suggests, "outsmarting mother nature." The issue is clearly a feminist one - refer please to Gloria Steinem's now classic essay entitled "If Men Could Menstruate" which suggests that men would undoubtedly be high five-ing each other and bragging about their monthly flow if the biological shoe was on the other, er, foot. The issue is also a literary one - menstruation is a real part of young women's lives - and should have some space at least in their stories, lest such narratives perpetuate age-old social silences and shame. So I'm on a quest - to find out more about portrayals of menstruation in MG and YA literature. Apparently, Millicent Min, Girl Genius discusses it in some detail. I'm running out to get it tomorrow to check it out. Can anyone think of other books? Undoubtedly, Margaret did a fantastic job of breaking the menstrual silence. But she's lonely. Who else will join her? My Little Red Book, by Rachel Kauder Nalebuff, is a nice addition to the menstruation literature. It's not YA fiction, but these first person accounts by adult women and what they remembered about their experiences with their periods provides the emotional and social stories missing from the 5th grade health class. I think this book and Are You There God, It's Me Margaret would make a nice gift set for a pre-teen! Sloppy Firsts, by Megan McCafferty (the first of the Jessica Darling series) uses Jessica's period as part of the plot. The stress in her life, constant physical training for track, and other issues result in her not having a period for ages. 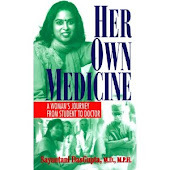 She worries about it, talks about it in journals, lies to her mother to keep from going to the doctor because she is afraid... It was refreshing to see a girl's period addressed as part of her story in such a realistic way. AGhhh you wrote a blog post about periods! Everyone! Run for cover! Are you there God it's me Margaret was ground breaking in it's time. 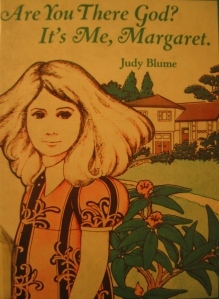 I so loved it, as my mom was a *blush* 'we don't talk about things like that' type of person, so Judy Blume for me was a breath of fresh air. Thanks for the walk down memory lane. I was just speculating that the reason Hermione was talking to Penelope Clearwater (a much older student) in the bathroom in Harry Potter & the Chamber of Secrets was that she was asking for help with dealing with menstruation. She's thirteen in that book, after all, and away from home with two boys for best friends. Fictional periods are so uncommon that I just make'em up. Hah! Plain Kate by Erin Bow has a scene where a girl gets her first period. It's been a while since I read them so I can't say exactly which ones, but I know the Pern series mentions menstrual cloths in several of the books. Thanks de Pizan! Must go check it out! Thanks for visiting! The Books of Pellinor by Alison Croggon also have menstruation in them!! Loved those books! Woot! Video of my BIF-6 talk available! To Celebrate My Good News, I'm Giving Away Free Critiques!